When talking to people in person and online about Vermont's flooding damage from Irene, I keep coming across an odd concept that seems to have washed in with the floods. Some people are viewing the skepticism about gravel mining and channelizing rivers as an effort to 'put the interests of fish in front of those of people'. Obviously the idea of people with such and agenda elicits concerns from residents... no one wants to lose their home in a flood to protect fish habitat. The thing is... the 'fish/human trade-off' is a myth. People aren't trying to stop the use of destructive methods of 'flood control' just to help fish. They are doing so because these obsolete methods don't control floods! 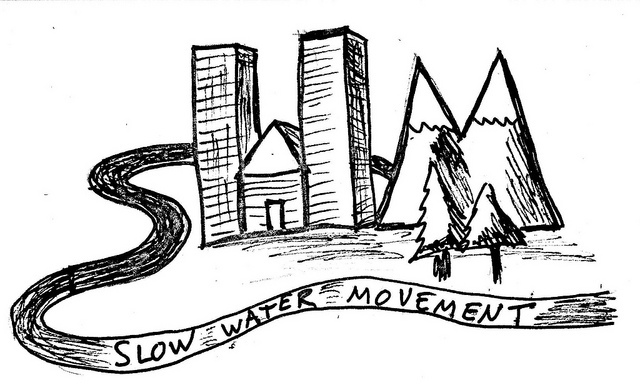 All too often, they involve damaging river ecosystems, while not increasing (and sometimes decreasing) flood safety! Some people think the mainstream environmental movement has gone awry in considering 'nature' as something that exists at the whim of, and needs protection from, us humans. I happen to be one of them. This is an outdated and illogical view. We don't need to save the rivers from us, nor do we need to over-engineer the rivers to save us from them. We need to understand the rivers and their watersheds, and use a combination of science, smart engineering, and local knowledge to come up with long-term solutions. We need to avoid knee-jerk, fear based reactions. Crews have been doing a great job of fixing infrastructure... an amazing job, in fact. When it comes to making major modifications to the rivers, though, we need to take a long-term view. The idea behind channelizing and gravel-mining of rivers is an old one. The Army Corps of Engineers spent a lot of time in the early 20th century channelizing and dredging rivers, and we are now spending a lot of time dealing with the long term effects of these practices, which include increased sedimentation and erosion, increased flood crest height, and decreased river flow during droughts. As is so often the case, people were doing what seemed best at the time... but we have learned a lot since that time. If you became sick, would you want to go to a doctor who would only use medicines and techniques developed before 1930? Some of these older practices are still very important today, but many have been proven to be ineffective or even harmful. The same is true with river management practices. Let's not apply bloodletting leaches and snake-oil treatments to our rivers, just out of stubbornness. Instead, let's use techniques that acknowledge the effects of the entire watershed and take all we now know into account. On the flip side, I've also run across a few people who have been advocating rivers who walk into town meetings filled with concerned residents and say things like "I have as much stake in the river as you do - I fish there!". As someone who very much loves 'my' river (as does everyone I've met in town) and also was threatened by it during flooding, I didn't feel very good when I hear these comments. I can't imagine how people who don't have as much background in the importance of river conservation feel about these comments, especially people less lucky than I am who spent the week after Irene shoveling mud out of their basements. YES, we all depend on the rivers, and yes, we should all have our say, since we are all dependent on the health of rivers. But, please understand that people directly impacted by floods do have a higher stake in the matter, because they are the ones at risk of losing their homes or even their lives when floods occur. Please do share ideas, speak your mind, and share your thoughts on why some techniques of river 'control' are counterproductive... but please also be respectful of those most impacted by the floods! Above all, thanks to everyone who cares about our communities and rivers! 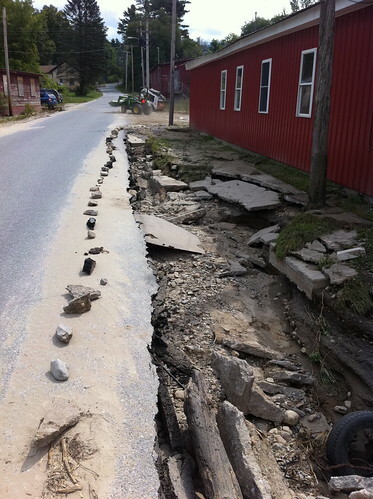 There have been some frustrations, but overall, Vermont's response to the Irene floods has been inspirational. This event will change how we look at and interact with our waterways, and it's looking like, despite a few challenges, the changes will be positive ones. It's outdated, cheesy, silly, perhaps mildly inappropriate (the rain is starting gang wars?) but also a tiny bit discouraging. People knew that they were degrading watersheds in the 1940s, and people tried to stop it from happening, but in so many cases it still did. Things are changing, but very slowly. I wanted to create a demonstration on why channelizing and dredging rivers can cause bigger flooding problems than it solves. But, I don't have a stream table so I had to improvise. 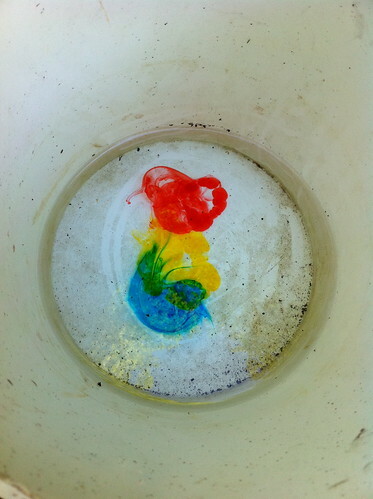 Instead I used a sloped sandy beach, a tin bucket, and a bin with a hole in it. Disclaimer: these 'simulations' are in no way scientific... they are heavily biased... very subjective... and can't actually represent any specific river conditions. But, rivers are incredibly complex and even the best of models often fail to predict river activity. This at least offers a visual demonstration of some of the concerns around dredging and channelizing rivers. The following videos simulate a flood passing through the above channelized river with a bend in it. A 'flood wall' (in this case made of clay) protects the village of 'West Centerbury'. The city has channelized the river to 'speed up the flow' in an effort to reduce flood risk. 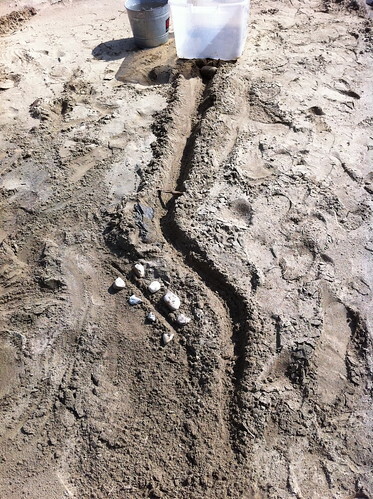 But, in this case, the channelization directs the flow right into the flood wall, increasing erosion. Each 'flood' is about 3 small tin buckets worth of water. Sorry for the shakiness of the video! I recently discovered the website Weatherspark.com , when it was posted on Google+ . This website allows you to obtain very neat graphs of historic weather, average weather, and forecast weather, as well as large maps showing temperatures and radar over large areas. While Wunderground.com , one of my favorite weather sites, had this information, it is much easier to see on WeatherSpark and also loads faster (I still prefer wunderground.com for its forecasts, conditions from user-established weather stations, and smartphone app). 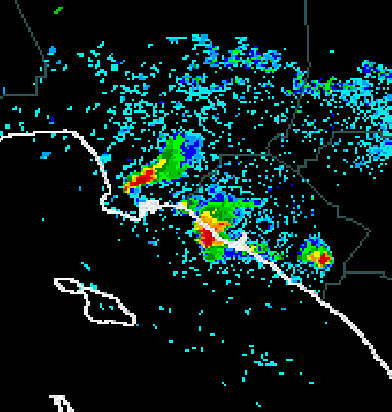 Recent severe thunderstorms in southern California (see this blog post). The coastal storms come in about half way through the animation, so if you want you can skip to those. Radar and wind speed as Irene moves up the US East Coast . You can also zoom into Vermont or other areas for more detail. August flash flooding in Pittsburgh (wait for the second storm cell!) as described in this blog entry. June 19, 2009 in Pittsburgh, another day when Junction Hollow had sewage-stormwater overflows. March 6, 2011 cold front - the radar itself isn't too exciting but watch the temperatures plummet when the cold front passes! (see also this post). This storm started as an unseasonably warm rain that we were worried would cause flooding due to the deep snowpack - but it soon turned into a brief ice storm, and then a record-breaking dump of March snow. These are just a few memorable weather events, and I'm sure I will think of more later. If you have one you'd like to see, either check out the URL and 'reverse-engineer' it or leave a comment and I'll do it for you. In the future I'll be able to include these maps with descriptions of weather and flood events. My friend Neahga took these fun animated GIF pictures of the waterfall on Otter Creek in Middlebury. They only 'work' as animations if displayed at full size, so I've put them behind the cut so they don't clutter up the blog for people looking for other posts. Click below to see them! To some, wilderness is a place 'untouched by man'. Myself, I don't buy into that idealistic and somewhat problematic idea. To me, wilderness is something else - wilderness is a place, a state of mind -where the impact and significance of humans is truly seen for the pitifully tiny thing it is. Our cities and farms and levees and homes are not replacing wilderness, they are simply distracting us from it. That isn't to say we shouldn't preserve wild, open spaces. We should. Nevertheless, I've felt and seen more wilderness on the Burlington, Vermont waterfront during a raging blizzard than I've felt walking trails in Yosemite in the summer. Lately there's been a controversy in actions the city of Middlebury has taken along the Middlebury River. I started making an upset blog post about it a few days ago, then deleted it, because the situation was too fast moving, and too politically charged, and I was feeling irrational and emotional. I may post about it in the future, but for now, here's the newspaper article about the controversy. I'm quoted here, as are others living in East Middlebury. In any event, I was feeling frustrated with the whole thing, and at the same time others in town had expressed concern about the condition of the river downstream from where this all happened. So, I set out to explore a new section of the Middlebury River. I set out, and what I found, was a wilderness. While much of the dialog about Pittsburgh's combined sewage-stormwater system centers around sewage discharges into the nearby rivers, for some residents and businesses in the Junction Hollow neighborhood the problem literally strikes much closer to home. Sewage and stormwater from the Four Mile Run sewer line has, on several occasions, erupted from manhole covers and flooded the neighborhood, dumping raw sewage into basements and flooding streets with many feet of filthy water. The remarkable video above, taken by local resident Michael Vincent, shows the explosive power experienced when aging combined stormwater-sewage lines are overloaded with water from a summer thunderstorm. This water is probably coming from the sewer line that channels the runoff - and sewage - from most of the historic Junction Hollow Watershed. It's Different when it is YOUR Home, and 'YOUR' River. Update: This situation is evolving very fast and appears to be much more complex and possibly problematic than I thought. For this reason I have removed this post for the time being, until it is more clear what is going on. I'll certainly have updates on the situation in East Middlebury soon. Just wanted to make a mini-post about some unusual weather in southern California. A cutoff low has allowed some severe thunderstorms to form in coastal regions of Orange and Los Angeles counties. These areas very rarely experience severe thunderstorms, and when they do it is usually associated with winter storms. These storms are moving from the southeast and have already been associated with some hail in Long Beach. The main hazard with severe thunderstorms in this part of California would probably be on the roads, especially the freeways. Check on the radar and consider altering your trip plans if you'd be on a freeway during one of these storms - visibility will be near zero and roads will be very slick, especially since it hasn't rained in a long time. Unfortunately, most of this rain is falling in the ocean or on concrete so it probably won't get to soak into the ground or provide water to local ecosystems. There is also some rain up towards Santa Barbara and San Luis Obispo, though, and hopefully this will help increase fuel moisture and decrease fire hazards in this area. Despite fears to the contrary, these thunderstorms do have significant rain, rather than just dry lightning. Defunding Stream Gauges: How Much are Lives and Homes Worth? During a year of some of the worst flooding the United States has ever seen, spanning just about every state except those in severe drought (such as Texas), the US federal government is planning to shut down 376 stream gages due to 'lack of funding' (Thanks to @wunderground on Twitter for this link). Apparently, a USGS stream gage costs around $15,700 a year to maintain, a minimal sum when compared to its benefits. Stream gages allow for accurate flood warnings, that save lives, livestock and property... allow for flood plans to be estimated more accurately... and provide information on water supply during times of drought. I'm trying not to get into politics too deeply here, since it is a contentious issue and I feel that this is a non-partisan issue and need. But, when I think about other things our government and economy expend money and resources on, and how tiny a speck the cost of a stream gage is in the grand picture, I am disgusted. Are human lives, or our homes and everything in them, or our, businesses, crops, and livestock that are our livelihood... not worth $15,700 a year in each of these watersheds? Are we, the people of the United States, unable or unwilling to demand that our representative government provide cheap and effective services that protect us from loss of life, or is the system so broken that the government is not at all representative of us any more? There should be many more stream gages being installed, none being removed, and many more rain gages also being added in upper watershed areas. The VTResponse people are doing an amazing job and helping organize flood recovery in Vermont. Who is going to step forward to protect us from the next flood? We have great people at the USGS already willing to process the data and inform the authorities of imminent flooding... but they can't do that without having the data in the first place. 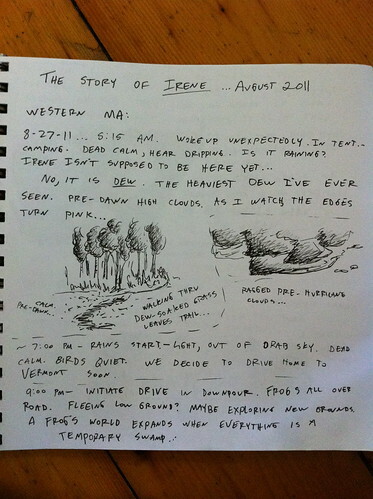 During Hurricane Irene I recorded some observations in a notebook, along with a few little sketches. 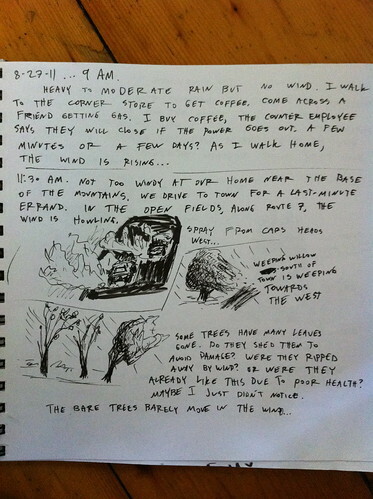 It's not the most detailed journal, and doesn't have all that much art (how do you draw a hurricane?) but I think it's interesting so I am posting it here. 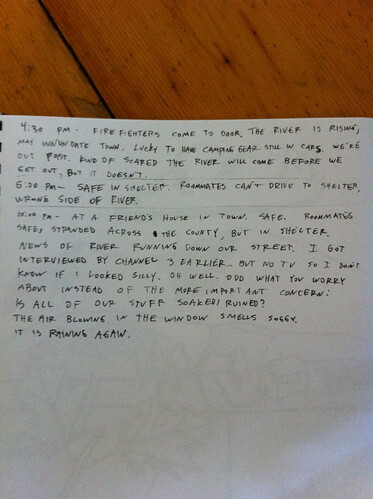 The most notable thing I observed, I think, is the fact that in many areas, such as East Middlebury, the storm didn't seem like THAT big of a deal... and I wrote something to that effect, and then minutes later the fire department came to our door and told us we had to evacuate before the river went down Main Street. This has been echoed by others in other areas, and speaks to the fact that flash flooding is dependent on what happens upstream, not just what happens where you are. Also, I noticed an interesting smell when driving through the start of the storm, and have heard elsewhere that others observed the same thing... did anyone else smell anything interesting or out of place during the approach of the storm? 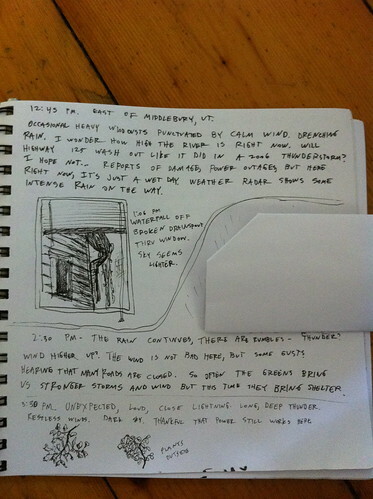 The journal starts in the Berkshires of Massachusetts, and then moves to East Middlebury, Vermont. I've mostly been using this blog to give updates on Irene, and before that information on Pittsburgh's recent flash flood. But, I figured that people are weary of only reading bad news and might like to see a project I've been working on instead. Long-time readers of this blog (if there are any) as well as any real life friends in Vermont will remember how excited I got about coloring icicles, and later coloring small urban snowmelt streams, to help show people the path of urban runoff. Lately, I found a bunch of food coloring on sale, and decided to see if I could find water movement in unexpected places. Because of diffusion, dye will move even through perfectly still water; the slight differences in the density of dye may also cause it to move. For the most part, though, the swirls and patterns created when food dye is placed in water are caused by otherwise invisible currents in the water. One of the small bright spots of Irene hitting Vermont have been the innovative ways people have found to use technology to help out. The group that is getting the most attention, and rightfully so, is VTResponse. This group, created by UVM student Sarah Waterman, has been helping connect volunteers with people who need help since shortly after the storm left. This group was the inspiration for us going to help in Brandon twice, and has brought help to a lot of people. There is also an unrelated website devoted to collecting donations for small businesses called VTIreneFund. I hope we see more things like this in the future, too. I have a soft spot for Google because I love the Google Maps and Google Earth products, which I use to make watershed maps like these. Google has helped out by creating this interactive map of road closures and other problems. It has been incredibly helpful. It isn't perfect, as there has been some incorrect or outdated information, but this seems to be due to the difficulty of keeping up with Irene news, and a feature of the information source itself, not of Google. There is also crowd-sourced information (see below). In any event, I just think it is really neat that Google, a huge corporation with no offices in Vermont, has gone out of their way to help out like this. Ushahidi is an app that allows for crowdsourced collection of info, especially during and after disasters. This app and associated website is the source for some of the info found on the Google Vermont Irene map. There is also an effort to map where flooding happened. I tried out Ushahidi on my iPhone last winter and it didn't seem to work well, so I deleted it and forgot about it. Now, it seems like the bugs have been worked out and the program is seeing more extensive use, so I'm going to give it a try again. There have been a lot of groups using technology to help out, so if I missed you, don't feel bad, but leave a comment here instead. On a less rosy note, Vermont residents should be aware that a storm containing moisture from Tropical Storm Lee will move through the state later today and Monday. There could be some flash flooding, especially in areas of unstable, eroded ground left over from Irene. Be very aware when using newly-repaired 'stopgap' roadways as these may be more vulnerable to washing out again. Keep an eye on the weather, evacuate if you see flooding that threatens your home, and just generally be safe! Hopefully this moves through fast and cleanup can continue. The National Weather Service has issued a flood warning for all of Vermont. Worst potential for flooding will be Sunday night into Monday, but scattered strong to severe thunderstorms could cause flooding sooner. This would normally only be enough rain to cause localized flash flooding. But most of the highway/bridge repairs around Vermont consist of soft, loose gravel and are not able to even withstand moderately high water. If you live in an area that had become an 'island' or almost became an 'island' during Irene, and you want to go home, BUY LOTS OF SUPPLIES! Be ready to be alone there again. Or, stay with a friend in Burlington or somewhere else safe. I think this flooding will be worse on mountain streams and small rivers, and less severe in places like the Winooski River and Otter Creek. There are no guarantees though. Please be safe! Yesterday I felt like I was doing a bit too much typing and talking and not being helpful enough, so I went with two friends to Brandon to see if any help was needed. We were sent to a rural road where a wood shop owner asked us to help direct cars away from undercut sections of road. The flood had heavily eroded this small country road, but there was a lot of traffic as people tried to find their way around. Apparently Brandon was totally out of traffic cones. So, this meant that we had to use what was available - rocks and flood debris - to mark off where the road was hazardous.